Following his knockout win over Edson Barboza at UFC Philadelphia, Justin Gaethje proclaimed that he is Khabib Nurmagomedov’s toughest challenge. Nurmagomedov’s coach, Javier Mendez does not agree with that statement. In fact, the longtime AKA head coach believes Gaethje isn’t much of a threat to “The Eagle”. “Not much,” Nurmagomedov’s coach, Javier Mendez, said on The MMA Hour. “Not much, because he ain’t going to be able to stop the takedown. None of those guys can. [Nurmagomedov will] take them all down, and if they don’t have much of a ground game, they’re done. Why Mendez believes Gaethje isn’t much of a threat is the fact that Nurmagomedov’s toughness would outlast Gaethje’s power in a potential fight. 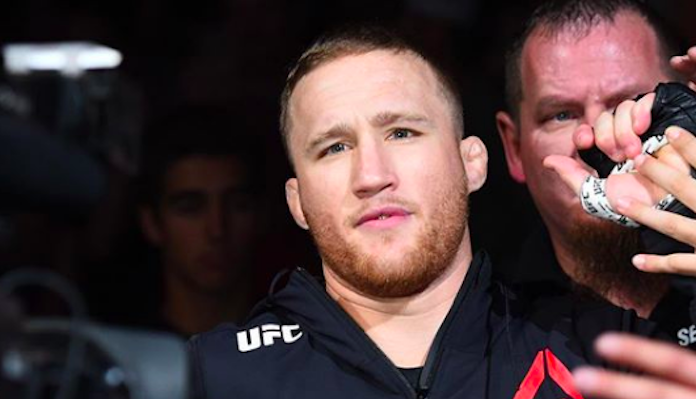 Do you think Justin Gaethje poses as a significant challenge to Khabib Nurmagomedov? Sound off in the comment section, PENN Nation!